My love for quick breads runs deep. 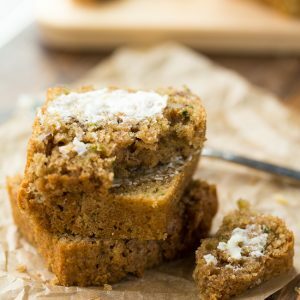 From Gluten-Free Zucchini Bread to Gluten-Free Pumpkin Chocolate Chip Bread it is hard to pick a favorite. However, my husband and boys have declared this Gluten-Free Applesauce Bread their all-time favorite! 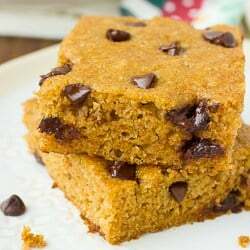 It is irresistibly good with a nice texture and cinnamon-spiced applesauce flavor. I like to make it in mini loaf pans and slather the little slices with softened butter. This bread will also turn out great baked in a standard loaf pan. Plus baking this bread will fill your kitchen with the most delicious fall smell – nothing better! The texture and flavor of this bread is undetectably gluten-free. 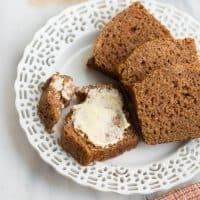 Like my other favorite quick bread recipes, I use my favorite flour blend (Erin’s Gluten-Free Flour Blend recipe here) for this applesauce bread. My favorite flour blend is a mixture of freshly ground buckwheat flour, almond flour, potato starch and arrowroot powder. It really makes the best gluten-free baked goods ever! Because buckwheat has natural elastic properties, this bread doesn’t need any added xanthan gum to achieve a good texture. I haven’t tried this Gluten-Free Applesauce bread made with a store-bought gluten-free flour blend, but will update this post if I do. Lately I’ve been using King Arthur Flour Measure-for-Measure Gluten-Free Flour Blend (not sponsored – I just love King Arthur Flour GF products) in some recipes and it has worked well. I’ve been happy with this blend but still like my flour blend best as you don’t get that grainy texture or starchy taste like other blends. 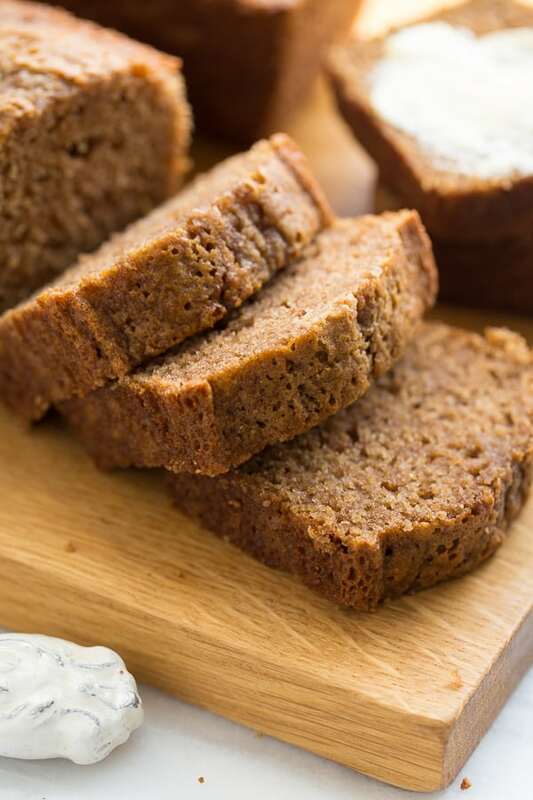 Make this Gluten-Free Applesauce Bread for a special fall breakfast treat! The 3 loaves don’t last long at my house. I could eat a whole one myself! Preheat the oven to 350F. Grease three mini loaf pans or one 9x5 loaf pan with cooking spray. In a large bowl, combine the eggs and coconut oil. Whisk to combine smooth. Add the granulated sugar, brown sugar, vanilla extract, almond milk, lemon juice and applesauce. Whisk until completely smooth. In a sifter set over a bowl, add the flour blend, baking soda, baking powder and salt. Sift until smooth. Add the flour mixture to the wet ingredients along with the cinnamon and nutmeg. Using a spatula or spoon lightly mix until just combined. Pour the batter into the prepared loaf pans. Bake for 25-30 minutes, until set in the middle for mini loaves. Bake for 45-60 minutes for a standard loaf, checking the loaf every 5 minutes towards the end of baking. Let sit in the pan for 10 minutes to cool, then turn out onto a wire rack to continue cooling. Store leftovers wrapped tightly in plastic wrap at room temperature. Enjoy! 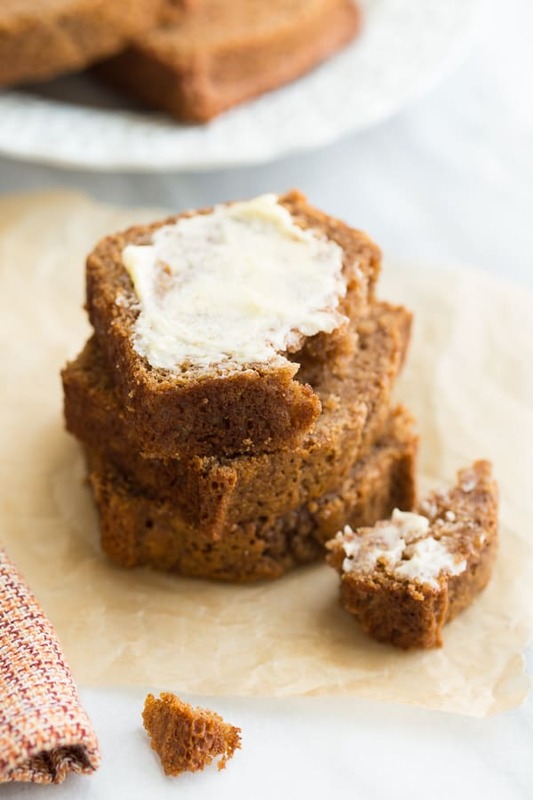 I like making this Gluten-Free Applesauce bread in 3 mini loaf pans. With a longer baking time, it also turns out using a standard 9x5 loaf pan. 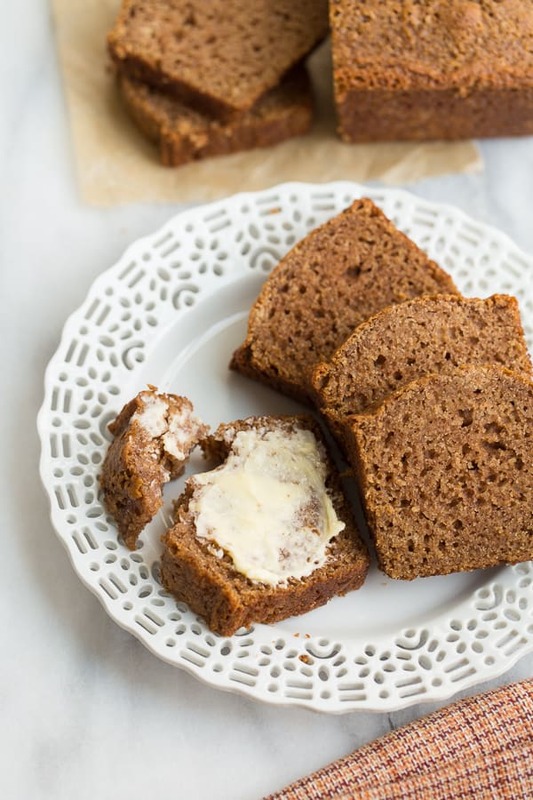 I prefer the texture and flavor of this bread when made with Erin's Gluten-Free Flour Blend. I was wondering if I could replace your flour blend with bob’s red mill 1 to 1 baking flour? Or should I add less flour or more ingredients? Use 1 3/4 cup Bob’s Red Mill Flour and keep everything else the same. That should work! Do you happen to have the nutritional information for this recipe? Thanks! I made mini loaves of this yesterday to go with Easter dinner. I followed the recipe exactly using the King Arthur flour, and it was delicious! We love this recipe. This bread is so moist with a perfect texture. Its a fall favorite at our house.